This is probably the coolest story I read over the Christmas break. There is an amazing trend in the recycling industry to change the framing of the recycling vision from a sorting problem to a mining problem. By treating recycling as a sorting problem you assume that you can accurately sort different materials to be obtain enough raw materials in a clean state to allow for efficient re-use. When you change your perspective to a mining problem it changes the parameters of the issue completely. Now, instead of error-prone manual or automated methods for sorting, you shift to mining and extraction methods that have been in use for centuries. This allows for much cleaner extraction of the raw materials and more material is recycled. Interesting take on the future of computing. If the copyright-infringement debate continues "as-is" it is only a matter of time before the general purpose computer, at least the way we see it today, is no more. This seriously makes me want to check out SWTOR just to try it. The video above shows what happens when a player uses the command "/getdown" during a battle. Unfortunately they patched this flaw as of 1/5/2012. Well, that saves me some time. 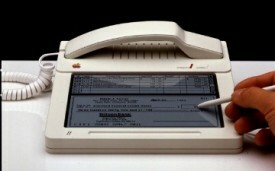 Wow, that is one cool phone, even by today's standards. I would LOVE to have had that phone back in 1983. E-books in the library are an interesting business model. This is strikingly similar to the argument for/against MP3/Video piracy. Publishers and libraries will have to come to some sort of agreement on this issue or it won't be long until we will see a world with no libraries (did you see the movie "I Robot"?). Either that or the publishers go away, which is already happening. For years there has been an article circulating to debunk Santa from the standpoint of science but this article goes the other way: how would you use current scientific thought and even unproven theory to postulate how Santa might actually pull off his holiday magic? Fascinating read.